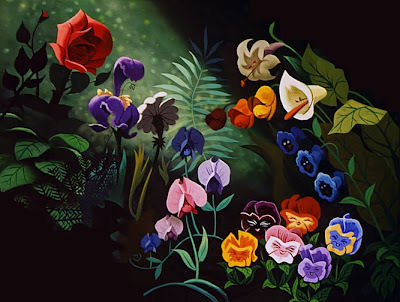 The dazzling artwork of ALICE IN WONDERLAND was hugely influenced by the virtuoso color styling of Mary Blair. This re-created pan background which opens the "Golden Afternoon" musical sequence is truly stunning. *sigh* Mary Blair. I love her work. ~the best dern french girl ever!! Your Blog hear on "Animation Background" is more than any words can express. I find that the only answer is that the hand of GOD had a hand in organizing this. Thank you for making this so we can see the masterful backdrops behind the world's greatest animation.